Pinoy Money Talk (shoutout to rainmen and futuregizmo!) 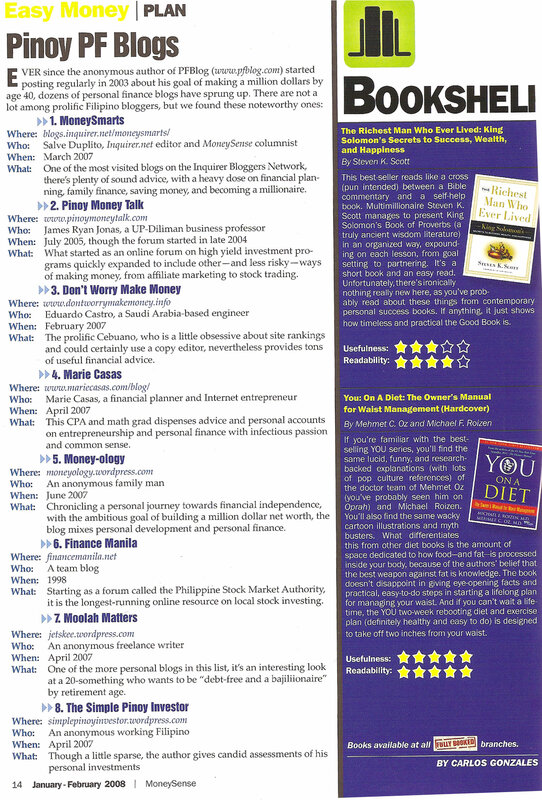 is #2 on the personal finance blogs list in the January-February issue of Money Sense. I’m listed at #4, not too shabby, hey. I’ve been putting in most of my blogging hours into our new tech blog Pinoy Web Startup for aspiring tech-preneurs but I do update our personal finance calendar here whenever there’s something new. Let me just finish up some paid research analysis gigs due this month and I’ll be back with some money articles in March. Please also join my survey for a financial products marketplace site. I need to have something extra to close the deal with my prospective investors. You want that financial comparison site at least as much as I do, right? One-stop-website to compare available time deposits, credit cards, investments, etc. Ah, dream come true. Congratulations, then. Wish I was too but i’m afraid I’m not much of a money marketing genius myself. Do you ever wonder why some junk blogs with nonsense content seem to have more visitors than your site? another great website for bank rate comparisons and bank news is http://mybanktracker.com, you should check it out. There is a financial comparison site for credit cards at http://www.compare.ph.